The community in the slums of Mumbai is at the heart of everything we do at Mumbai Smiles. Even though we work to improve their living conditions and access to opportunities, we in fact end up receiving much more from them in return—lessons on contentment, positivity and how to make the most of everything you have. That is why we try and include interactions with the community members whenever we have guests visiting us to see our work. On 17 September 2018, we organised a day-long visit for two foreign guests, Miguel and Noelia. We first took them to meet Sarita, one of the parents of a preschool student from Saibangoda. The visitors were impressed to see the small but beautiful home where Sarita lives with her family. 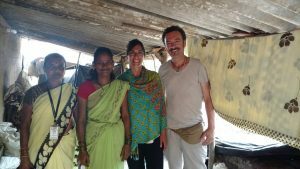 She interacted openly with them and told them how she and her husband are working hard to provide a better life for their family and how Mumbai Smiles is helping them. The visitors then went to our new preschool in Powai, where they took part in a clay-shaping activity with the students. At the end of visit, the guests were quite moved by the work that we are doing and the potential it has to improve lives. They expressed their gratitude to Komal, the visit coordinator, as well.